Rent-to-Own can be frustrating. Rental-Union was started because folks just like you are ready to start owning their home and need a roadmap. We understand the rent-to-own market and have a proven solution. We’ve made a comprehensive, easy to do process. But the best part is that we are giving it to you for free! It doesn't matter what your credit situation is, we provide rent-to-own resources to everyone. Stop renting and start owning! We all want to be homeowners. It’s the American dream! So, we have created this website full of tips and useful information as a step by step guide on what you need to do to make your dream of becoming a homeowner a reality. 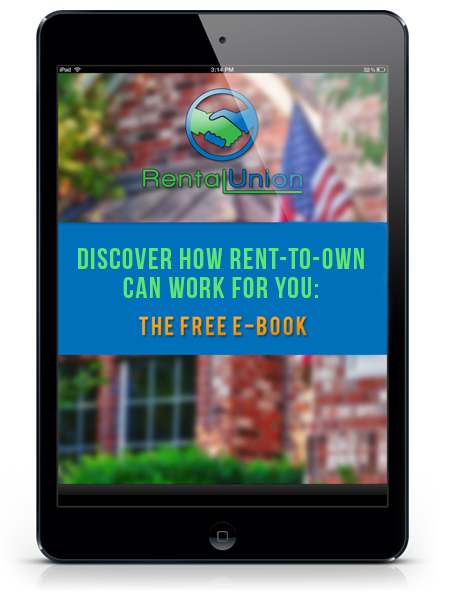 With our very useful and informational ebook you will quickly learn how you can easily negotiate a rent-to-own contract on your own and get on the road toward home ownership. Working on your credit is the first step in the right direction towards becoming a homeowner and improving your life! Review current listings to begin your home search. Also, remember you are not limited to only those listings. Our Ebook provides you with all of the information you will need about how to negotiate a rent to own home. You can move in WHILE you work on your credit! "Not only was I educated on the mortgage loan process, but Rental Union, they provided me with the tools to acheive my goals of home ownership." "Rental Union's resources gave me the knowledge to negotiate the home of my dreams into a rent-to-own home." "Getting into a home was easier than I thought. Rental Union showed me the steps I needed to get into a home." "Rental Union's resources are top notch. I am currently living in my forever home, thanks to the tools Rental Union provided me."